Susan Hubbard is a professor of English at the University of Central Florida, where she received the College of Arts & Humanities’ Distinguished Researcher Award in 2008. She has won teaching awards from Syracuse University, Cornell University, the University of Central Florida, and the South Atlantic Administrators of Departments of English. For more information, visit Susan Hubbard’s website. Ethical Vampire — (2007-2010) Young adult. Publisher: “If you ever want to hide from the world, live in a small city, where everyone seems anonymous.” That’s the advice of twelve-year-old Ariella Montero, who lives with her father in Saratoga Springs, New York, in a house haunted more by secrets than by memories. 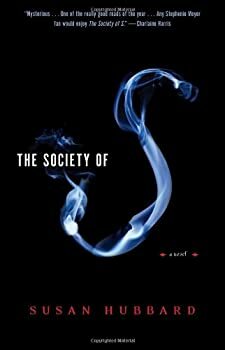 The Society of S traces her journey south, to Asheville and Savannah, and on to Florida, as she learns that everything she knows about her family is a lie. When she finds her mother, she learns the truth: Ariella is a fledgling member of the Society of S. S stands for Sanguinists: a sect of environmentalists concerned with ethics and human rights — although they happen to be vampires. S also stands for synesthete: a person able to see words and letters in colors. The letter S is lucky for Sara, Ariella’s mother, who gravitates to cities such as Savannah and Sarasota. But will it be lucky for Ariella? Susan Hubbard’s novel is an intricate literary mystery that raises provocative questions about the way we live now. Ariella’s voice will lure you into a world where you’ll meet the others among us: vampires who cope with their special nature and need for blood in a variety of ways, ranging from the savage to the mundane to the scientific.